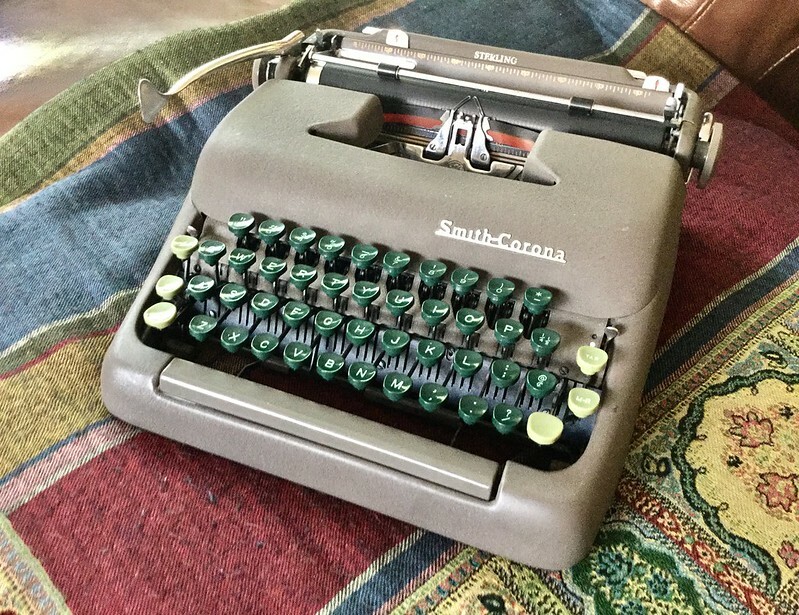 After the Associated Press article on the typewriter revival came out several weeks ago, some people took notice that I live in the local area, including a lady named Sandy, who had in her possession her mother's Smith-Corona Sterling. No, I don't need another typewriter, but this one has an italic typeface. Sandy called me last week, inquiring if I'd care to take it off her hands, and I agreed for her to come over Sunday and I'd take a look at the machine. I've always been amused by the styling of machines from this era, with their muted colors (or lack thereof) in drab grays and browns, with just a hint of excitement from the two-tone green keys. Automobiles from the same era were similarly adorned in muted color schemes; was it because of some intrinsic modesty, or simple economics? Even the shape of these 5-Series machines reminds me of late-1940s cars, with their rounded curves. The machine turned out to be entirely functional, excepting the end-of-line bell wasn't working, caused by a bent bracket. And it was very dirty inside, evidence of having never been serviced. Her mother purchased it in 1949 from a small town in Kansas, though it lacks a dealer sticker. It took me hours and hours to get it adequately cleaned and adjusted. Years of eraser debris had accumulated inside, enough to pit and stain some of the metal surfaces. Extensive cleaning with naphtha and alcohol took care of most of the grunge, however. The type slugs were caked with old ink and grease, the worse I've seen, and took an extensive session with toothpicks, toothbrush and alcohol to render clean. Luckily, I have Ted Munk's Typewriter Repair Bible for these 5-Series Smith-Coronas, for I went through the machine, checking in turn each adjustment. It actually wasn't too bad. The right side of the space bar sat lower than the left, which required reforming (i.e. bending) the support arms to get it flush with the body panels, while ensuring adequate travel to trip the escapement, with room to spare. The four screws that hold the space bar to their brackets needed to be loosened and the space bar adjusted to be square to the opening in the body panels. The other adjustment needed was the tripping point of the type bars. They should trip the escapement to advance the carriage one space when the type slugs just approach the front of the type guide. With this machine, the escapement wouldn't trip until the type slugs were almost in contact with the ribbon. The adjustment involved bending an arm in the escapement mechanism. As is common with these machines that've never been serviced, some additional degreasing in the slots of the segment were required for some of the type bars, which would subsequently hang up while test typing. I've found that, even if you think the machine is fully functional, you need to do some extensive test-typing to iron out those intermittent problems that remain. I find using disposable mascara brushes, with alcohol, to be a good way to clean the slots of the segment. I like this italic type face; it's the first in my collection, and the main reason why I purchased this machine. I think it'll be a good letter-writing machine, which is what the lady's mother did, as evidenced by what she told me, and the observation that the right margin was set inward so as to correspond to the width of letter-writing paper. The Sterling is at the lower end of the 5-Series line. It lacks the end-of-line indicator found on the left end of the platen roller in the higher-end Silents; has fixed tabs with metal slugs that can, if so desired, be set to one's liking; and the platen roller is not easily removable without unscrewing the right carriage cover and loosening a nut. This machine has a bit more of a mechanical clanking sound to it than the Silents in my collection. Perhaps it's due to being a lower-end model; or because the thin rubber washers originally located on the body panel screw holes have all dissolved into tar. I'll have to find some replacements at the hardware store. I don't really need another machine in my collection, unless it were highly desirable. This is my third 5-Series machine, which I'll probably keep just for the italic type face. But if I had the opportunity, I'd certainly pick up the little Sky Writer, one of the best ultra-portables. What I'm thinking of doing with some of these "surplus" or redundant machines in my collection is to donate them to a local school classroom, should I be able to locate a teacher so inclined. I don't want to incur the expense and risk of shipping them out of town, otherwise I'd sell them online. I think this is a reasonable approach to maintaining a working collection of typewriters, while not permitting them to get out of hand and control my life. As you learn over time your personal preferences, you can adjust your inventory accordingly. Fixing these surplus machines up, then passing them on to others who'd like to experience the manual typewriter lifestyle is our responsibility as aficionados. It certainly beats having them be discarded to the landfill, or be victims of the key-choppers. One bonus item of Ephemera included with the typewriter was a generic plastic typewriter cover. It's beige in color and in great condition, though lacks any Smith-Corona branding, so I'm thinking it was sold along with the machine by the shop in Kansas. It turns out this cover is large enough that it will serve as a usable cover with even larger machines in my collection, such as the Hermes 3000. Were I of the mind to, and adequately equipped with sewing machine, it'd be nice to use this cover as a template for making colorful cloth covers for sale. I'm just not certain I want to get in the typewriter cover business. But maybe a small sewing machine is in my future. Perhaps. Post-Script: Written via Alphasmart Neo at my local cigar store lounge. I didn't feel like walking back home in the afternoon heat lugging a typewriter, even a small portable. We had a great response to Typing Assignment #1 on my YouTube channel, with 18 participants entering their one-page typewritten pieces. For many of you, this was your first foray into creative writing, which I can only respond by feeling grateful that this project has already born some creative fruit. I hope you continue to be inspired and wear out many more ribbons with your future writings! These short pieces, though each unique, had many aspects in common, especially the devotion and love reflected between machine and user. There was also a strong sense of melancholy, for these machines having sat so many years and decades in disuse, before being rediscovered. Humor was also in plenteous supply, with one writer having the typewriter revolution being started by the machines themselves, and another writer stating that the machines collect their owners - not the other way around. For anybody like us collectors who've sensed that magnetic attraction to some otherwise anonymous thrift store, only to find some wonderful machine inside, waiting to be taken home, we can certainly relate. Of course, a single page is entirely inadequate for many of these stories to be fully realized; but that is another reason why these one-page assignments are so worthwhile, in that they require just enough creative effort to whet the juices into further expanding the treatment into a full-blown short story, which I hope many participants will take advantage of. 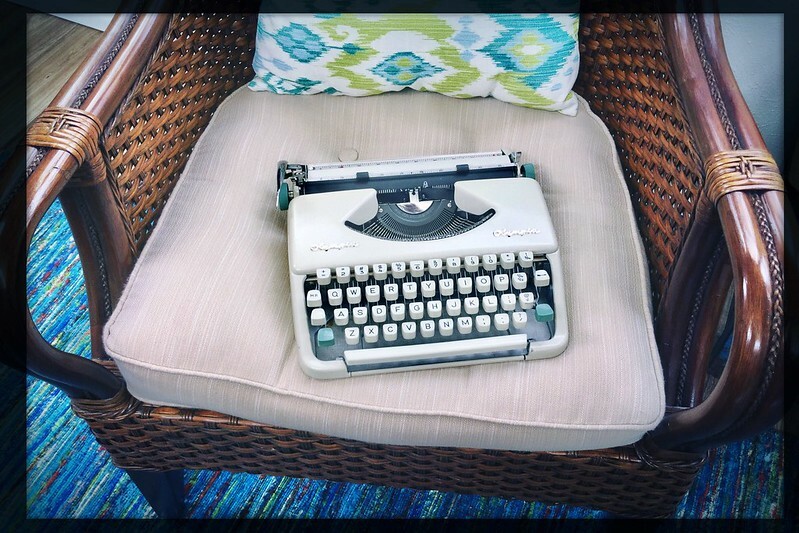 Typing Assignment #2 is less fictional creativity and more along the lines of analytical thinking: write a one-page essay on what you find unique and/or valuable about using typewriters as writing tools. Unless I hear otherwise, we'll assume the due date will be next Sunday, July 2. Please have your entries written, scanned/photographed, posted to social media and the link posted into the comments section below before then. If you require more than one week for this assignment, please post a comment into the YouTube video itself; I'll consider extending the due-date based on responses. I suspect enough of us are typewriter aficionados that we already have a good idea of why we like to use these machines for creative writing. It's easy to see coincidences where there perhaps aren't any, but earlier today I'd posted a video and blog article about the first in a series of Typing Assignments. Do things like this blow on the wind, like pollen or dust? The very day when I issued this first creative writing assignment, my grandson returns to the typewriter after a long hiatus. All we can do is count our blessings - and keep writing. In last week's blog article I introduced this new video project that I call Typing Assignments, loosely inspired by Ted Forbes's photo assignments series on his The Art of Photography YouTube channel. Today I introduce Typing Assignment #1, which is to anthropomorphize your typewriter and have it describe how it "found" you, and how it feels about its relationship with you, the writer. 1) This is not a contest. Scores are not given, points are not earned. 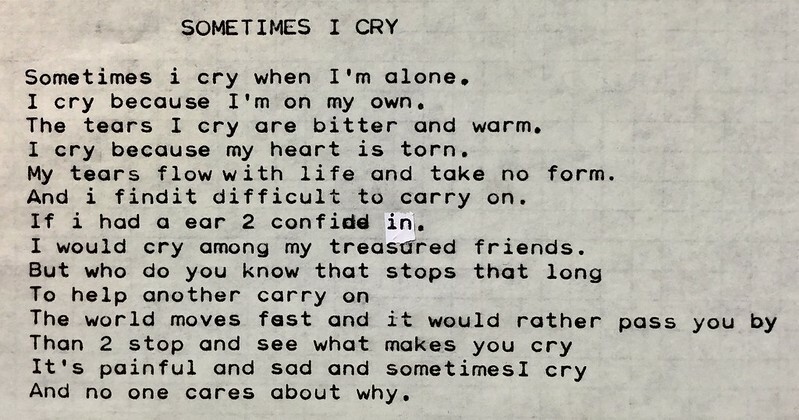 This is your assignment, to help foster creativity using your typewriter. 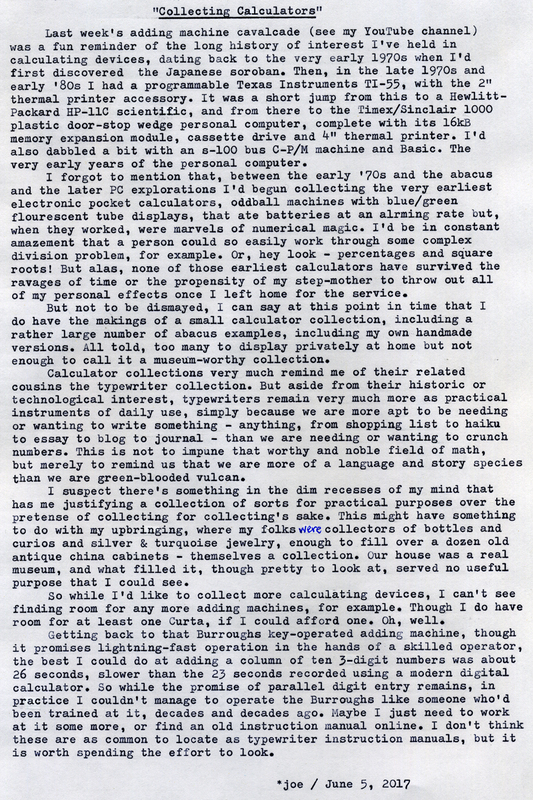 2)The piece has to be typewritten (electric or manual) as a single page. Single, double, triple spaced - doesn't matter, as long as it's legible. 3)Neatness doesn't count. 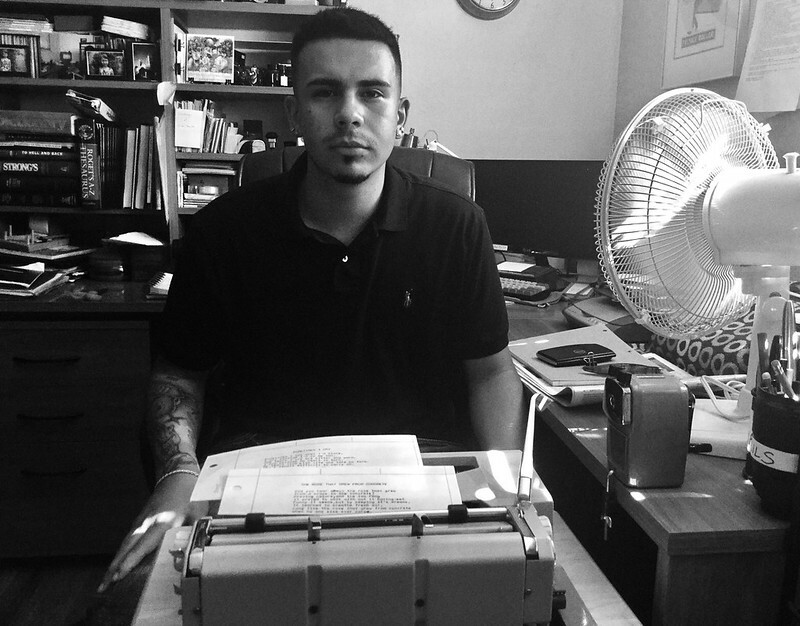 Typewriters are ideal for first-draft, stream-of-consciousness creativity. Corrections, strike-throughs and revisions are just evidence of the creative process at work. 4)Post a legible image online. Photograph or scan the piece under good light. Tweak it to be easily readable. Post it online as a publicly-viewable image. 5)Post the direct URL to the image as a comment below, along with the name you'd like to be called. Also include something about what typewriter you used, if you wish. Please have your piece written, posted and linked in a comment below by next Sunday, June 25. I screen my blog comments, so it might take a while for your comment to appear. I'll do my best to capture images of as many as I can and include them in next Monday's video, wherein I will also present Typing Assignment #2. Have fun, and remember: This is an opportunity to bond with your typewriter as a tool for fostering creativity. I was pleased to see in my inbox a link to this Associated Press article about the typewriter revival. I knew it was in the works when I was interviewed, back in early April, by the article's author, Russell Contreras, who I met again at the Type-In later that month. These kinds of stories come out once every few years, it seems. Just do a quick search and you'll see that the typewriter revival has been ongoing for at least a decade. They're fueled as much by the novelty and romantic ideas of these classic old machines as they are by the reality of more and more people rediscovering and putting them to practical use. Which gets us to the subject of a new project I'm starting on my YouTube channel, Typing Assignments. This is inspired a great deal by Ted Forbes's photo assignments series on his The Art of Photography channel, where he gives an assignment, permits time for participants to create the required images, then culls them from social media and presents a slide show of the results. I'm going to be using a similar method, but will be asking participants to post a link to the online image of their one-page typewritten piece as a comment to an accompanying blog article, to be posted here every Monday, along with the YouTube video of the new assignment. As the series progresses, I will be showing highlights of people's work as a slide show in the next week's video. This will be the most challenging part of the project, getting images of sufficient quality from the participants' postings and including them in the video. What interests me in this project is the idea of promoting creative uses for typewriters. Sure, we love to look at them as a form of decor; and many of us also enjoy tinkering with them; along with the thrill of the hunt for new specimens, for our museums of mechanical wonders. 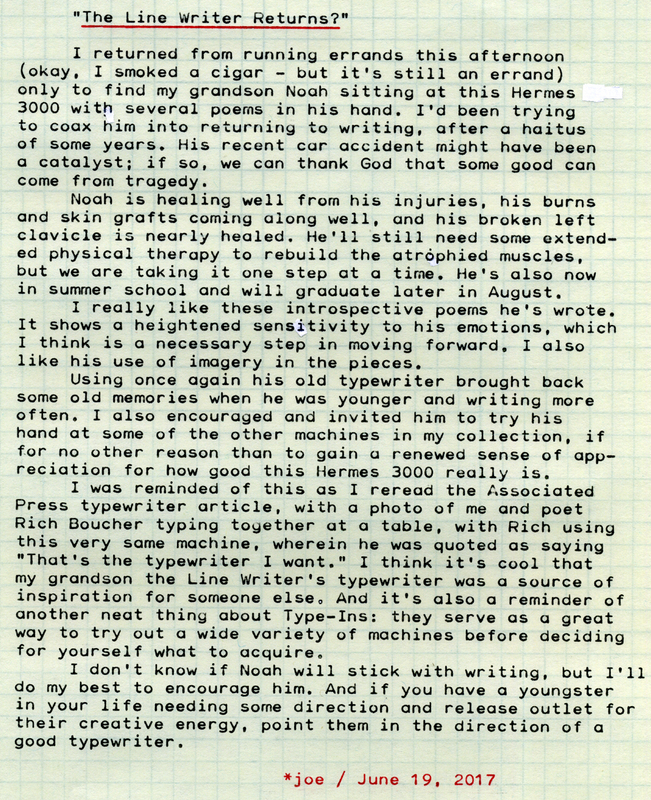 But it's the practical use of typewriters as catalysts for creative writing that I'm interested in pursuing - a subject that has been visited repeatedly on my Typewriter Video Series. 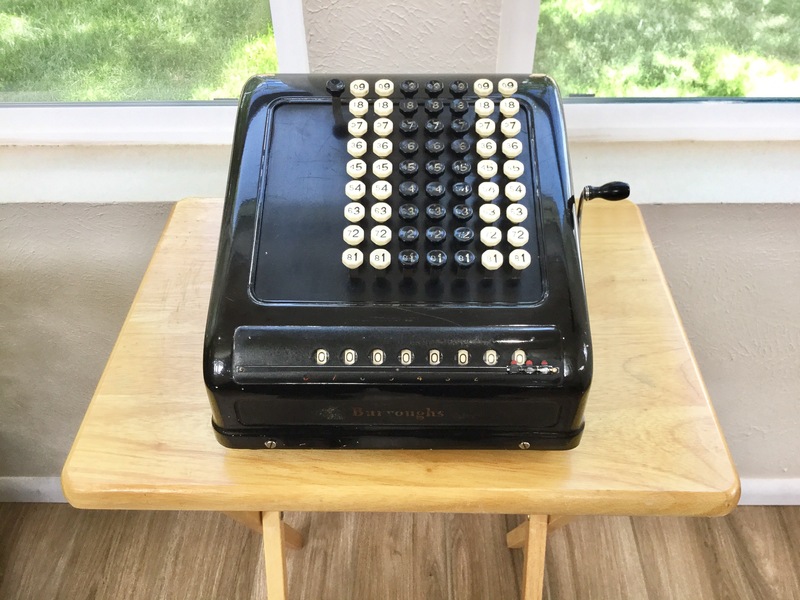 Post-Script: I've ordered a copy of a Burroughs key-operated adding machine manual, dated from 1939, so when I receive it and have time to review it, I'll post again on any findings I glean, especially in regard to more efficient methods of operation. The little ad hoc speed test I conducted between a 10-key electronic calculator and this Burroughs "comptometer" yielded unexpected results. I'd expected to be able to enter the ten 3-digit numbers into the Burroughs in parallel fashion, using three fingers and/or both hands, thus decreasing the time to nearly a third of what one might do on a conventional calculator keyboard, where each individual digit has to be entered one-at-a-time, in serial order. But the efficiency of finger placement on the ten-key pad made up for any advantage gained from parallel digit entry - and, as a matter of fact, I wasn't able to achieve true parallel digit entry on the Burroughs, due to a combination of factors, most notably because of my poor finger placement. The height of each row of nine keys on the Burroughs machine is a wider span than what I can comfortably manage, plus they are arranged in vertical columns, meaning I'd have to use some odd hand placement where my elbows are splayed out sideways and my fingers are parallel to the columns of keys. I did some Internet research and found an old bulletin board discussion thread from circa 2003 concerning these machines. 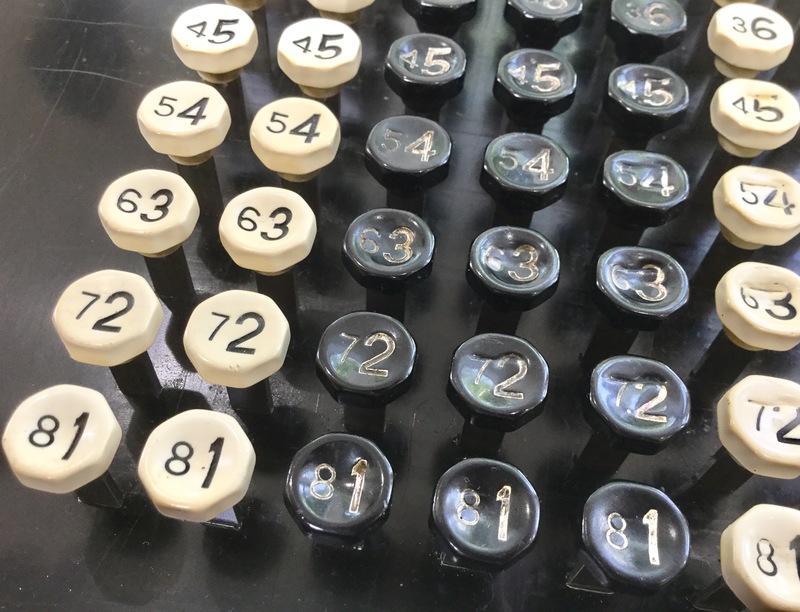 It seems experienced operators were able to deftly conform the position of their fingers to that required for each number grouping, and then quickly stab their hand down upon the keyboard, thereby simultaneously hitting all the keys of a number at once. Were I able to do that, I'm certain the results of my speed test would have been different. This does in large measure remind me of the training and practice required to be a proficient abacus operator. And also reminds me that, although I've never been truly proficient at the Japanese soroban, it's one of those skills requiring constant practice, like a musical instrument, as an analogy. And thus there is the expectation that I could, in due time, put in the necessary practice time to actually use the Burroughs machine to its intended purpose. Which, if I do so, will require at least another blog article and accompanying video. One aspect of the Burroughs machine that I failed to expand upon in last week's video was the fact of it having octagonal keys. These are very elegant in appearance, also reminding me of the old Oliver 5-series typewriters. I'm also reminded, on a personal level, of my maternal grandfather who, back in the 1930s, built an octagonal farm house in Florida, at a time when such configurations were considered especially daring and innovative.